While in Florida for our annual family reunion earlier this month, I was taking a time exposed shot of the moon’s reflection on the Gulf of Mexico. The “bonus” was when a person searching for something on the beach momentarily aimed the flashlight in my direction. Here are a few more night shots with both moon and city lights shining. For more examples of this week’s challenge, click HERE. I went through my hometown last week and had breakfast with an old high school friend, Mike. Actually, he treated me to breakfast in his small cafe on the first floor of a 22-story office building in East Memphis. While an unfamiliar setting, it brought back memories of what epitomized local dining when his parents operated the restaurant in the community near the University of Memphis. Known for serving heaping portions of comfort food, lines extended outside during the lunch hour(s). Though not the same restaurant, last Wednesday’s visit to the vastly scaled down version brought back a number of memories. My friend’s mother, who operated the cash register in the glory days, was there napping in a chair. Presidents and celebrities adorned the walls…then and now. The walls were covered with pictures of the Presidents that adorned the original walls, along with celebrity photos which extolled the good times and food that were enjoyed decades ago. Note of thanks from the Eagles. As customers drifted in and out, mainly getting coffee and breakfast sandwiches “to go,” Mike returned to our table with every break to catch up, just as I remember his dad making the rounds at the original restaurant, conversing with his guests. My friend would occasionally ask customers if he could pray with them, including a young woman who worked in the building but came by with her 4-week old son to grab a treat. Mike knew that her 7-year old son had been dealing with a severe case of scoliosis and had been praying for him. The young mother reported that he was now out of his brace much quicker that doctors imagined. She gave credit to the Lord and the prayers of Mike and others for her son’s speedy response to treatment. I lead in a prayer of praise. That is the epitome of “local”…that personal care and attention to the needs of others through good service and genuine interest. Mike is carrying on that tradition! For more examples of “local” click HERE. 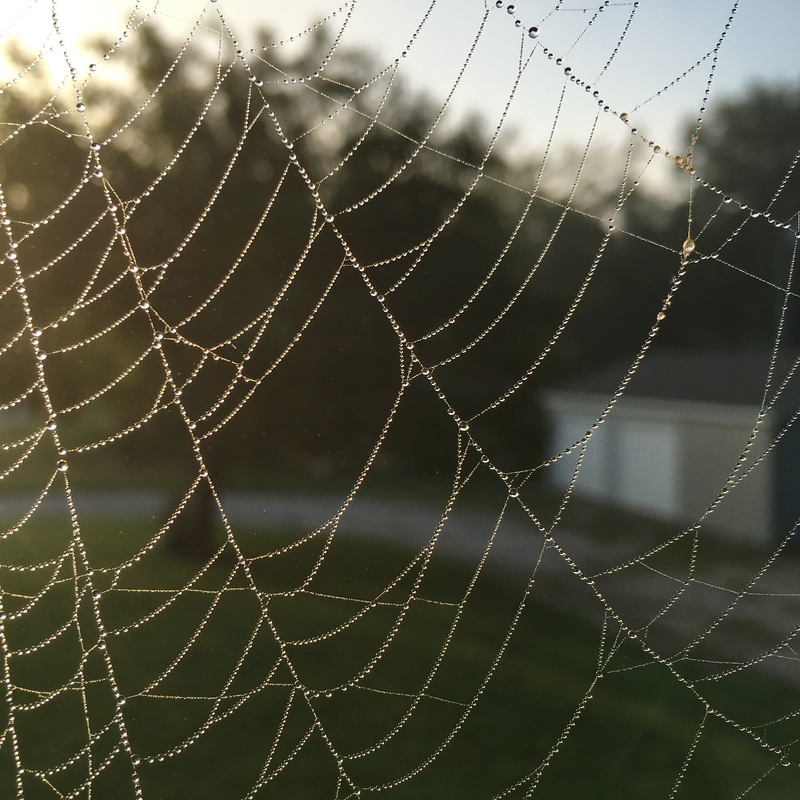 The best part of high humidity on a early summer mornings is that the huge spider webs that have been woven overnight are more visible. You can find more wonderful pictures of “Morning” HERE. You can find some more examples of what’s above you when you “LOOK UP” these additional examples of this week’s photo challenge. Following Cheri’s suggestion to check out the “Finding the Best Shot” post, I chose to show both landscape and portrait orientations of the same sunset. Which do you prefer? While the landscape orientation is a rural Iowa shot, it almost has an African savanna feel to it. Before the sun went totally behind the horizon I took this portrait orientation, allowing me to zoom in on the trees and catch the “fire” in the trees. For more examples of the week’s landscape theme, click HERE. Our city has the privilege of hosting a hot air balloon competition every September. An average balloon system – envelope, gondola, fuel tanks, and 40 gallons of fuel – will weigh about 600 pounds, deflated on the ground. Adding two to three people will increase the weight by another 300-500 pounds. But, once the envelope is filled with hot air…weightless! This post is in response to the WordPress Weekly Photo Challenge. “A place of quiet refuge, an enclosed place of thought and contemplation, separated from the city around, but near the sky and earth.” Philip Johnson, Architect of the John Fitzgerald Kennedy Monument in Dallas, Texas. The John F Kennedy Monument, designed by architect Philip Johnson, represents a cenotaph, or “open tomb,” to symbolize the freedom of JFK’s spirit. It is a 30 feet high and 50 by 50 feet wide roofless room, constructed with 72 white pre-cast concrete columns. Positioned within two-blocks of the Dealey Plaza and the spot of the President’s assassination, this is a must see if in Dallas, Texas. For more examples of “monuments,” click HERE. I forgot about this little series taken during our community’s annual Hot Air Balloon Days’ parade. While waiting for the parade to begin, a church member’s four-year old granddaughter found the perfect playmate with whom to dance in sync – herself. After watching this muskrat’s intrusion on the gaggle of geese, I spotted what looked like two rocks on the water’s edge about 100 yards away. Through the lens I could see that they were, indeed, muskrats, who were feeding on something. Since this was my first time to see muskrats in the wild, I was intrigued at watching them eat, submerge into the icy water and then emerge with some underwater vegetation to continue their feasting. For more examples of “juxtaposition,” click HERE.